A 74-year-old former mayor of a Long Island community who neighbors say was also a retired NYPD captain died Wednesday when his boat exploded in a marina, spewing thick black smoke into the air that could be seen miles away, according to a local official and police. Officials have identified the man who died in the boat inferno in Port Washington's Manhasset Bay Marina Wednesday as Bob Hogan, former mayor and trustee of Plandome Manor, a small village in North Hempstead. He served there from 1994 to 1995. Neighbors said Hogan was a former NYPD captain and a Drug Enforcement Agency agent. "I know he loved his boat, he was on his boat almost every weekend with his family," said Meir Gil. "He's just a very special guy and a true gentleman." 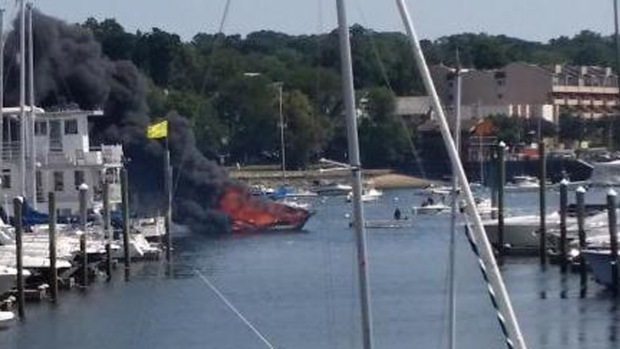 A 75-year-old man was killed Wednesday when a boat exploded in a Long Island marina, Nassau police said. Ida Siegal reports. Hogan was killed when the boat exploded while being refueled, authorities said. Another man on the boat escaped by jumping in the water. The workers helping refuel the boat escaped without injury. The burning boat then drifted to a nearby dock and damaged other boats before being towed away by a third worker from a separate dock, police said. The worker who towed the boat away had some burns to his arms and face. Some nearby boats had minor damage and scorching from the explosion. One boater said part of a cooler flew into his vessel after the blast. The cause of the explosion is not known, police said. Authorities say they haven't yet determined if a crime was committed in the explosion, but Nassau County homicide and arson detectives are investigating.